Position a rack 3 inches from the broiler. (Note: You can position a rack only 4 inches from the broiler. To get the pan 3 inches from the heat source, I turn over a rimmed sheet pan and set it on the rack— do this when the fish is ready to be broiled.) Preheat the broiler to high. If you know how to supreme citrus fruit, do that, squeezing and reserving any juice left in the rinds, then skip to step 2. Otherwise: Slice off the ends of each orange and the lemon. Squeeze the juice out of those ends into a medium bowl. Discard the rind. (It’s handy to have a garbage bowl nearby for this step.) Stand each piece of fruit on one of its cut sides. Run a knife down the side of each orange and the lemon to remove the skin. Squeeze the juice out of those skins into the bowl, then discard. Remove each citrus segment by running a knife down the side of each membrane and slicing the segment out. Drop it into the bowl of juice. Once all of the segments are removed, squeeze the remaining membranes into the bowl to extract the juice. You should be left with a bowl of beautiful segments swimming in a lot of juice. Pour one tablespoon of the juice from the bowl of citrus segments into a large bowl. Add 1 tablespoon of honey and 1 tablespoon of olive oil. Whisk to combine. 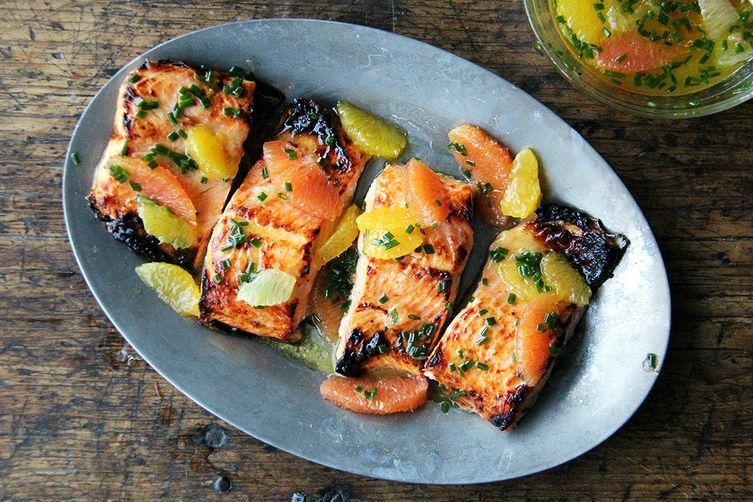 Add the fillets of arctic char and toss to coat. Let marinate for at least 5 minutes. Meanwhile, pour the remaining 2 tablespoons olive oil into the bowl with the citrus segments. Add the chives and a big pinch of sea salt. Stir to combine. Taste. It should taste similar to a salad dressing with perhaps less of a bite. It should not be emulsified. Rub a sizzle pan or sheet pan or broiler pan lightly with neutral oil. Remove fillets from marinade, letting excess drip off—no need to pat dry. Discard excess marinade. Place the char fillets skin side down in the pan. Season the flesh with salt (and pepper, if you wish) to taste. Place a sheet pan upside down on the rack (see why, if you’ve forgotten, in step 1), then place the pan with the fillets in it on top. Broil 4 to 5 minutes. Remove pan from oven and immediately transfer fillets to a serving platter. Spoon sauce over top. Pass extra sauce on the side.